Capt. Scott here...In the spirit of blogging on a regular basis, I want to encourage you to come down to fly fish in November, especially if you have flexible travel plans. The only problem with Autumn fishing is the impact of fresh cold fronts. If you can fish in between the fronts, which is pretty easy until mid-December when they start coming more frequently, you can enjoy halcyon days on the LLM, with some of the best birding action on the westside and sight casting on the sand that you can imagine. Big trout action increases as the low tides of mid-December through February make them more visible in the gin-clear, vegetation-free water of winter time. Remember: Neither the reds nor the trout leave the bay in the winter; they just move in and out of the shallowest waters as the temperatures rise and fall. So don't rule out the fall and winter fishing. But neither should you make inflexible plans. Book on Southwest, and plan on rescheduling. That way, you can play the weather at a time when most people are playing cards. Of course, if you can drive down on short notice from central Texas, then you're really in control. The reds are fatter and larger, on average, through the winter. Hi Friends, I have decided to move away from a one-sided fishing report to an interactive blog that will allow you to ask questions, post comments, and take part in a conversation with me and other anglers. An occasional fishing report can create the impression that "you should have been here yesterday," as if there was something special about yesterday. Those of us who have lived and breathed fly fishing on the Mother Lagoon know that any day can be the best day, and any tide can be the best tide. In some sense, there's no substitute for "showing up" after you ascertain that the weather is tolerably acceptable. Magic can happen on any day, and who knows why? Certainly, an experienced guide can predict more accurately the cycles of fish movements, etc., but ultimately the variables are so vast that "expertise" translates into an ability to adjust knowledgably to changing conditions. That's what I aspire to. I look forward to this blogging format, because it gives you a change to post questions and comments. I will be notified by email whenever you post here, so you can be assured that I will respond to you in short order. During the last two weekends, I have guided an old client and a new one. My old clients Chuck Thomas and his two sons, Charlie and Zack, came down and fished with me for two days, as they usually once or twice a season. We were fortunate that the reds were podding and tailing in a very shallow back lagoon where there were no other boats. We spent two magical mornings stalking tailing pods of reds until the mid-morning. After that, the fly fishing was tough, but we all agreed that the early action was worth it all. Yesterday, I guided Dave Pennock from Colorado and San Diego (rough life, right? ), who had never been to the LLM. He'd spoken to someone in San Diego who mentioned me and the stellar fly fishing on the LLM, so Dave opted for four days. Roel Villanueva took Dave out on Thursday, and I guided him on Friday, just before a cold front blew through. We had a wonderful day, finding tons of reds in the same lagoon as when the Thomas' were down, and then found them as far east as you can go--in the extramarginal waters of the "sand." 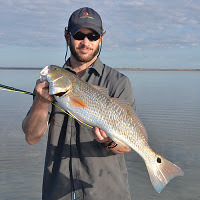 While we had an abundance of redfish on the westside, they were feeding aggressively and swimming quickly from one place to another in off-colored water. It was exceedingly hard to follow the targets, and Dave only landed one fine red there before we headed east. When we reached the east side, the surface was glassy even though the breeze was rising. We poled into the glassy expanse and quickly spotted tailing reds spread out ahead of us. It was classic, demanding sight casting where you could see every nuance of the redfish's behavior. Dave did marvelously for his first trial in such sensitive conditions, landing three more nice reds over 25 inches apiece. Alas, a cold front blew in in the middle of the night, and Dave opted to go home early with my support. I always second guess myself when I pull the plug due to weather. It looks pretty now, and I wonder if he should have stayed. But when you're in the middle of a "blue norther," and sunshine seems to be a distant memory, it only makes sense to head for home. I think he's be back.